A beautiful meditation on life in the Great Plains from award-winning author and poet Kathleen Norris. 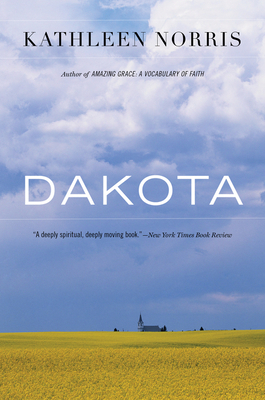 Kathleen Norris invites readers to experience rich moments of prayer and presence in Dakota, a timeless tribute to a place in the American landscape that is at once desolate and sublime, harsh and forgiving, steeped in history and myth. In thoughtful, discerning prose, she explores how we come to inhabit the world we see, and how that world also inhabits us. Her voice is a steady assurance that we can, and do, chart our spiritual geography wherever we go. Kathleen Norris is the author of two books of poetry, Falling Off (1971) and The Middle of the World (1981) and has received awards from the Guggenheim and Bush foundations. She lives in Lemmon, South Dakota, with her husband. Norris presents Dakota as “my spiritual geography, the place where I’ve wrestled my story out of the circumstances of landscape and inheritance.” What are the circumstances that make up her story? In what ways do the other inhabitants of western Dakota experience this “spiritual geography”? In addition to providing us with a sense of Dakota weather and the Dakota landscape through the course of a year, what purposes do Norris’s “Weather Reports” serve? Do they have any elements in common that have a unifying effect on the book? There are repeated references to the cardinal virtues of Christianity—faith, hope, and charity. How do these virtues fit into the context of life in the Dakotas? What additional virtues—e.g., hospitality—does Norris suggest have primary value, and why? In “The Beautiful Places,” Norris writes that “especially in western Dakota we live in tension between myth and truth.” What “myths” and “truths” does she present that illustrate this theme? Does she suggest ways to resolve this tension, or is it characteristic of all communities? What constitutes a healthy sense of community in Norris’s view? What are the main characteristics of such a community? Can such a community exist, or is it more an ideal—like a monastery—that one strives for but never attains? The concepts and varieties of “gossip” and “story” are important to Norris. What kinds of gossip and story does she identify, and what values does she ascribe to them? Does her own “story” share elements of both? What role do women play in Norris’s rediscovery of faith and worship and in her exploration of life in the Dakotas? Does she see a difference in the ways men and women respond to the same landscape and various aspects of spirituality? Norris speaks fondly of the “playfulness” of monks. Why does she view this playful way of being as a paradigm for life? Can it be an element in our own daily lives and, if so, in what way? Norris presents a series of extreme contrasts as characteristic of western Dakota geography, weather, life, history, etc. In what contexts do these extremes occur? How do they affect the attitudes of native Dakotans and Norris? In several places, Norris speaks of “the desert wisdom of the Dakotas.” What are the primary qualities of that “desert wisdom”? What is the link between that wisdom and the contemplative life? In “Frontier,” Norris writes, “The spirit of the land is not an abstraction in western Dakota, but a real presence.” How does she make this evident throughout the book? How is “the spirit of the land” a real presence in the lives of Dakotans? What connections are there between this spirit of the land and Norris’s own spiritual quest? Several of Norris’s very brief chapters are entitled “God Is in the Details.” How does she discern the presence of God in these details? How does Norris illustrate her statement, in “Gatsby on the Plains,” that “It is the community that suffers when it refuses to validate any outside standards…”? How does a community suffer in such a situation? Does Norris present any specific communities that benefit or suffer from either adopting or resisting outside standards? Norris maintains that Dakotans feel they are “in the middle of the world rather than, as others would have it, in the middle of nowhere.” How does she support this idea in the book? Is it enough to change your view of how you imagine Dakota? Comparing poets and Christians, Norris writes that “we are people who believe in the power of words to effect change in the human heart.” How does she show this belief at work? Does she exhibit a change of heart by the end of the book. Do we?